Posted On Wed, 20 Jun 2012 00:17:21 +0000. Filed in HealthVault, quantified-self. By Vaibhav Bhandari. Apologies I have been a bit on blogging hiatus! 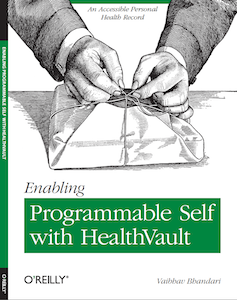 Among other things, I recently released my book on HealthVault, Enabling Programmable Self with HealthVault. Quantified Self blog covered the book and the story behind it in its toolmaker talk series. Over next few weeks I’m hoping to post about a number of topics including Restful Health Exchange, NwHIN Governance, FHIR, HealthVault mobile applications and I’ll also be updating the compendium website for the book – www.enablingprogrammableself.com. Please let me know in comments if you have suggestions for me to write about. P.S. - I also moved on from Microsoft and I’m active in healthcare and technology community travelling frequently between Seattle, Bay Area and sometimes Minnesota.